An interesting product idea for managing the devices on your desk. But do the benefits outweigh the size? A great idea for expanding the capabilities of your computer and your desk. A design and implementation that definitely needed more refinement. While the idea is great, the implementation is not. Perhaps waiting until the second version is the best idea. Some of the design issues are detailed in the Functionality section, as they prove to make the device difficult to use. Other issues are detailed under Build Quality, as they affect the physical condition of the device more than its appearance. That being said, the actual design of this hub has its positives and negatives. On the positive side, the ability to swap out modules and add new capabilities is a pretty cool one. The concept of being a portable, powered hub and charger is unique and useful. On the negative, the module system appears to be broken. Included inside the body are 9 ports: 4 for USB and 5 for power. Unfortunately, 4 of the power ports seem to be completely useless, as they are in the corners and do not have access to the outside of the body, nor are they positioned such that a Qi or equivalent module would be useful there. Only the center port seems to have practical use. Also, as a device that is designed to be portable and handled, providing only a glossy top cover is a disappointment. Since the cover is capable of being removed (to install modules), it would stand to reason that the cover itself would be interchangeable and customizable. The real downfall of this device is its build. The USB 3.0 connector on the back is incredibly flimsy. We have tested 2 separate units, both of which broke within moments of plugging in the included USB cable. A simple alteration of the port's mounting mechanics could solve this problem, filling in the fairly large gap above the USB port to prevent pressure from snapping solder joints inside. In addition, the power plug appears to have been designed for a different device. The pin sticks out way too far for the length of the shaft, leaving most of the barrel exposed. The 3 included USB ports also seem to suffer from a similar problem to their connector counterpart, feeling as if they will break off at any moment. Due to the fragile nature of the device, the functionality is limited. While the retractors remain the best way to use them, even they are not perfect. The retractors work about as well as any retractable cord, often locking up and not spinning back inside. Pulling them all the way out and pulling can usually fix the problem after a few tries. If you are using the USB plugs, you will be disappointed to learn that they are installed upside down. 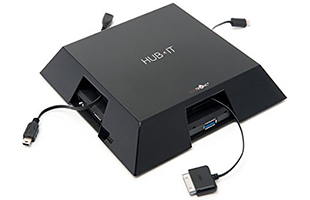 While it wouldn't seem like a huge issue, devices that require space above them will not plug in to this hub without hanging over the end of a desk or table. Also, in our testing, we have experienced intermittent issues when reading/writing on a USB flash drive and using a wireless mouse concurrently - the mouse often fails to move. Under normal circumstance, however, the device seems to function as expected, with the noted exception. I have connected 2 phones, a wireless mouse, SD card reader and 2 flash drives and had little to no operational trouble. For a product that is, at least partly, billed as a portable device, size and weight are important. Fortunately this device weighs nearly nothing. Even with 5 modules installed and USB devices plugged in, you almost don't know that it exists. Unfortunately, the size does not match the weight. The device is absolutely huge - tall, wide and long. Considering a 7 port USB hub plus a Nokia Qi charging plate are about 1/4 the physical size, it seems a little overkill in its size. The truly unfortunate thing about the size is the amount of unused space inside (detailed in Design). Because of the nature of the device, it is compatible with just about anything. It would seem that a device sporting USB ports would actually be completely compatible, but some of the design decisions make it less than universal (detailed in Functionality). The ability to change out USB and power modules means that it can be expanded. Our test unit has the new Qi unit included, meaning that I can even charge one of over 70 handsets and other devices. In the collection of modules available are Nokia, Samsung, Apple, Sony and Nintendo proprietary connections, plus Qi, micro, mini and full USB.